Senior Alberta government cabinet ministers expressed different opinions Monday on what effect carbon capture technology would have on reducing pollution from the oilsands industry in light of internal government documents that call that technology into question. Previously secret ministerial briefing notes obtained by CBC News under freedom of information legislation said only a small percentage of carbon dioxide released by mining the oilsands can be captured and injected underground for storage. The briefing notes are based on the findings of a joint Canada-Alberta task force on carbon capture and storage. 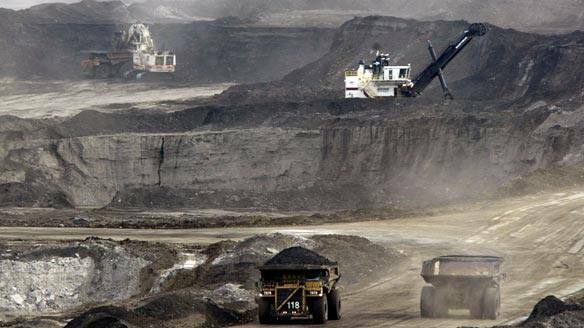 Carbon dioxide emissions from Western Canada’s oilsands are set to increase from five per cent to 16 per cent of the national total by 2020 under current plans. (Canadian Press)CBC News has obtained a government document that says reducing greenhouse gases from Western Canada’s oilsands will be much more difficult than some politicians and the industry suggest. OTTAWA – Lawyers for Friends of the Earth Canada gave the Government of Canada notice yesterday that they will be appealing a recent Federal Court decision in Canada’s first ever climate change lawsuit. The much anticipated appeal comes one week before the world gathers in Poznan, Poland for the next round of international climate change negotiations. The original lawsuit was launched in June by pro bono lawyers from Paliare Roland Barristers and Ecojustice (formerly Sierra Legal Defence Fund) on behalf of Friends of the Earth Canada. They were seeking a declaration from the court that the government had failed to meet the legal requirements of the federal Kyoto Protocol Implementation Act (KPIA). These requirements include a Plan based on meeting Kyoto targets and drafting and enacting legally binding regulations to combat climate change. What happens in Northern Alberta is no longer a provincial issue. You either loved it or hated it last week when Maude Barlow, chairwoman of the Council of Canadians, compared Alberta’s oilsands mines to the bleak, desolate landscape of Mordor ruled by the Dark Lord in the fictional trilogy Lord of the Rings. A U.S. bill would seemingly bar U.S. federal agencies from buying “dirty oil” products – including those originating in the Canadian oilsands. Here, a protest banner hangs over a tailing ponds in northern Alberta. CALGARY – A last-ditch effort to amend an energy bill that appears to ban the sale of “dirty oil” products – including those originating in the Canadian oilsands – to U.S. federal government agencies has failed in Washington. Section 526 of the U.S. Energy Independence and Security Act of 2007 bars U.S. federal agencies such as the military and the postal service from buying alternative fuels if the production creates more greenhouse gases than conventional fuels. Since it was signed into law last December, opponents have been fighting to repeal or amend it, not so much because they are concerned about Canadian energy exports, but because it appears to counter U.S. Defense Department experiments with coal liquefaction fuels. Late Wednesday, the U.S. Senate denied an amendment to Section 526 that had been packaged with a Senate authorization bill. “This is a big step for clean-energy supporters,” said Alberta Greenpeace campaigner Mike Hudema. He agreed the bill could also be read to prohibit other non-conventional fuels – possibly even biofuels, depending on how they are produced – unless the section is clarified. The defeat Wednesday means the end of the battle for this president and this Congress, said Matt Letourneau, spokesman for New Mexico Senator Pete Domenici, the senior Republican on the Senate Energy and Natural Resources Committee. He said the amendment didn’t have a realistic chance of passing the Senate anyway, which is controlled by Democrats, but added that a growing number of Washington politicians in both parties are worried about the section’s implications. “Our concern would be that when those (fuel) contracts expire, a group could interpret 526 in such a way to say that it prohibits the U.S. from obtaining oil from tarsands, for instance, and then there would be a lawsuit from Greenpeace or whoever else and it would work its way through the courts. 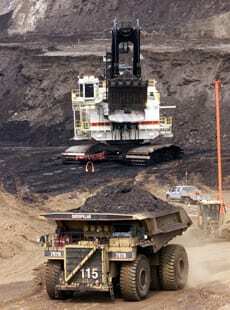 More than half of the crude oil produced in Canada comes from the oilsands and that proportion is expected to rise. The Canadian Association of Petroleum Producers and several Canadian politicians have called for clarification of the clause. Mining trucks carry loads of oil-laden sand after being loaded by huge shovels at the Albian Sands oilsands project in Fort McMurray, Alta., in 2005. (Jeff McIntosh/Associated Press)Fuels derived from Alberta’s tarsands could find a tougher market in the United States after Congress decided Thursday to uphold legislation restricting imports of fuels from high-carbon sources. The decision was celebrated by environmental organizations that have been campaigning against changes to Section 526 of the U.S. Energy Independence and Security Act of 2007. Members of Congress have spent the past nine months contemplating whether to repeal or weaken Section 526, which deals with fuels from high-carbon sources such as tarsands oil, liquid coal and oil shale. Fred McDonald, a Métis trapper and storyteller extraordinaire, often questioned the reasoning and science behind the proliferation of toxic ponds and end-pit lakes. Before he died in 2007 of kidney failure, McDonald lived in Fort McKay, an Aboriginal community 72 kilometres north of Fort Saskatchewan. The stench of hydrocarbons from the surrounding mines often hangs heavily in the air there, and in 2006, an ammonia release from a Syncrude facility hospitalized more than 20 children. Following the massive lawsuit filed by the Beaver Lake Cree Nation last month (and the one filed by the Woodland Cree last year), the Chipewyan Prairie Dene First Nation came forward on June 4th to file their own lawsuit against the Alberta government. The CPDFN say they weren’t consulted when the government leased away “the heart” of their traditional territory to MEG Energy Corporation for an oilsands (tarsands) project. Focusing primarily on their Treaty Rights, CPDFN hope the lawsuit will require Alberta to hold ‘meaningful consultations’ so as to protect one of the few remaining places in their Traditional Territory where they can exercise their rights. See below for a press release from the Chipewyan Dene Prairie First Nation. EDMONTON, ALBERTA–(June 4, 2008) – Today the Chipewyan Prairie Dene First Nation (”CPDFN”) filed legal action in the Alberta Court of Queen’s Bench against the Alberta Government alleging a breach of Alberta’s constitutional duty to consult with the First Nation on MEG Energy Corp.’s Christina Lake Regional Project, Phase 3. This Project is planned to be located in the heart of CPDFN’s Traditional Territory, between Christina Lake and Winifred Lake, the breadbasket of the First Nation. Canada’s oilsands industry, already the target this week of a major British investment firm’s campaign against the “climate-hostile fuel,” is now under fire from an international alliance of environment and investor groups, which has urged the U.S. securities regulator to rewrite proposed new rules on reporting petroleum reserves to reflect the “potentially enormous risks” – financially and ecologically – associated with the “carbon-intensive” Canadian energy source.